Bringing Reiki to your local shelter, rescue or sanctuary is not always easy. Sometimes, staff may not understand what Reiki is and, because of this, may be a bit circumspect about allowing it to be used with their animals. On the other hand, what if Reiki is welcomed at your facility? How can Reiki volunteers succeed in building a solid program that will stand the test of time? In reality, all Animal Reiki practitioners working in shelters are educators simply by the nature of the work they do. People want to know what Reiki is and why it might be helpful to use with the animals. And so a dialogue must begin. Following are some ideas for how Reiki Practitioners (and Teachers, too) can create a solid Reiki program at the animal facility where they volunteer. The best way to open doors to Reiki is by establishing oneself as a team player and supporting all the work the shelter does. Don't be afraid to offer your volunteering efforts in other areas besides Reiki. Often, this will help you to meet other volunteers and staff members more easily. Once people know you and trust you, it will be much easier for them to hear about something like Reiki, which they might be unfamiliar with. Sometimes, the best way to explain the benefits of Reiki is to allow the response of the animals to do the explaining for you. Let the staff and volunteers lead the way in the "Reiki conversation" by asking questions about Reiki that are based upon the interesting observations they've made of the animals with whom you work. Once you have established yourself as a trusted volunteer and there has been some interest in what it is that you are doing for the animals, it might be time to share a bit more with the staff and volunteers. Try offering some short chair treatments to people while you are there. You can also teach a short 60- or 90-minute seminar in which you can teach a few self-healing Reiki techniques to the people at the shelter. As caregivers to the animals, they may often have to deal with unpredictable and stressful situations. Learning to de-stress and rebalance using some simple Reiki techniques can have powerful results! Once staff and volunteers have experienced for themselves a bit of Reiki's relaxing effects, it will be easier for them to realize how it might help the animals in their care. Now that the staff and volunteers have seen the animals respond to Reiki and felt the healing effects of Reiki on themselves, there may be interest to find out more about what Reiki is and the many ways it can help animals to heal. Offer a two- or three-hour seminar to staff and volunteers, introducing them to all the basics of Animal Reiki. If you charge a nominal fee, you can give the proceeds to the shelter as a fundraiser. Future introductory seminars can be opened to the public, bringing in more potential volunteers as well as more fundraising dollars. Although you cannot officially train people in Reiki until you receive your Level III Reiki training, you can do a lot to educate people about what it is that you are doing and why Reiki should be a mainstay for the animals in that facility. Now that Reiki has been introduced on multiple levels at the animal facility, it might be time to offer a Level I Reiki/Animal Reiki class. Since the time requirement is much more at this level, it may take some time to organize and schedule, but this is time well spent. So remember to be patient and allow it to unfold as is best for the staff and volunteers of your facility. Once the staff and volunteers have been trained, they will be able to begin offering Reiki to the animals in their care and see the results for themselves! It is important to continue to support your students in their learning, so it's a good idea to set up a monthly Reiki practice group at the shelter. Open the group up to not only your own students, but also any other Reiki volunteers who may be helping at the shelter. Practice groups are a great time to share in meditation, practice Reiki techniques, do partner chair treatments and also practice with the animals and meet afterwards for discussion and feedback. As your students continue to gain experience, make sure to keep in touch with them regarding their Reiki treatments -- both successes and challenges. Make yourself available for questions as they arise. Encourage all your students to keep an "Animal Reiki Journal" where they can record their treatment experiences and results. Some of these treatment experiences might be perfect for sharing with others; SARA is always looking for new stories for our blog, so keep that in mind! As you continue to watch your students grow, the time may come when they are ready for a Reiki II class. This is a wonderful way for them to deepen their own Reiki journeys and learn some more techniques to support the work they are doing for the animals. *It's good to keep evaluations from students at every class and seminar you give. These will help you improve what you are doing and how you do it, as well as help you to see what you are doing well. Remember to check in regularly with the director of the facility to see how the Reiki program is helping, how the staff perceives it, and how you can be of more help in the future. Taking the time to develop ongoing relationships with the people in the facility where you volunteer is the best way to ensure that you build a solid foundation for your Reiki work there. 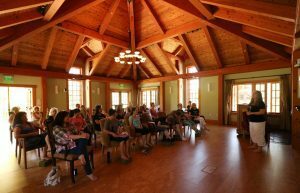 Being able to share more about the work that you do, along with simple techniques that people can do right now to help heal themselves can go a long way toward facilitating a calmer environment for the animals in the facility. Educating people about what you are doing can also help deepen communication within the shelter about which animals might need healing and which animals are responding well to treatment. This may lead to future case studies, which in turn can lead to a deeper knowledge about the beneficial effects of Reiki for animals in shelters. Training staff and volunteers to do Reiki themselves is a wonderful way to bring more Reiki to the animals, as well as empower the people who work there. As you can see, it takes time, patience and hard work, but building a Reiki program with a solid foundation will be a win-win for everyone: you, the animals, the staff and volunteers, and even adopting parents. When is the best time to begin? Today: the animals are waiting for you!